Fiber optic connectors include plugs that feature a protruding ferrule that holds the fiber in place and an associated adapter for aligning and mating fibers to form a connection point. The first ferrules introduced in the 1970s were comprised of metal or a hard plastic, and then in the mid-1980s, the introduction of the ceramic ferrule improved alignment and allowed for lower insertion loss. Over the past several decades, the market has seen the introduction of various fiber optic connectors aimed at providing lower insertion loss performance, lower cost, higher density and/or easy termination. In fact, according to the Fiber Optic Association, in all there are about 100 different types of fiber optic connectors. Thankfully you don’t need to know the ins and outs of all of these types of connectors since there are just a handful that make up the majority of what you might come across in today’s cabling plants. 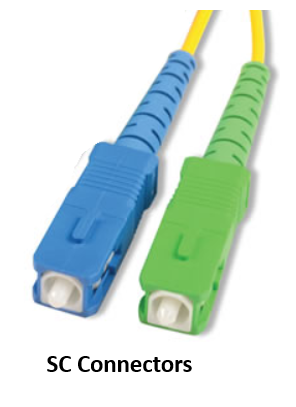 These standard-compliant connectors are covered by EIA/TIA-604 Fiber Optic Connector Intermateability Standards (FOCIS). Let’s take a closer look at the types you might come across and how they differ. SC, FC and ST fiber optic connectors all feature a 2.5mm ferrule size and can therefore be mixed and matched using special hybrid adapters. Developed by Nippon Telegraph and Telephone (NTT), the SC connector is easily recognized by its square shape. It features a snap-in design that mates using a push-pull action with a spring-loaded ferrule. Available as simplex or duplex, the SC is covered by TIA-604-3 (FOCIS-3), and due to its excellent insertion loss performance and fast deployment, it dominated as the connector of choice well into the 1990s. It still likely remains the second most common fiber connector type for simplex and duplex applications. Unlike the square plastic SC, the FC (ferrule connector) is a round threaded connector that uses a stainless-steel housing around the ceramic ferrule. Covered by TIA-604-4 (FOCIS-4), the FC uses an alignment key and is tightened firmly using a screw-like motion, which makes it popular for high vibration environments. While it was the most popular singlemode connector type for several years, due its higher cost, it has been widely displaced by other connector types. Covered by TIA-604-2 (FOCIS-2), the ST connector type was introduced by AT&T in the late 1980s. It is a spring-loaded connector that looks very similar to the FC but uses a bayonet design instead of a threaded screw. This quick connecting bayonet design originally made ST connectors popular for campus, enterprise and military multimode networks, but because it does not support an angled polish (i.e., APC) preferred for today’s telco and FTTX singlemode deployments (you can read more about that here), its use has declined considerably over the past decade. In the late 1990s, there came a demand for small form factor (SFF) connectors to support high-density environments. Originally developed by Lucent Technologies in response to their telco customers wanting a smaller, low-loss connector, the LC connector by far has achieved the most success of all SFF connectors. 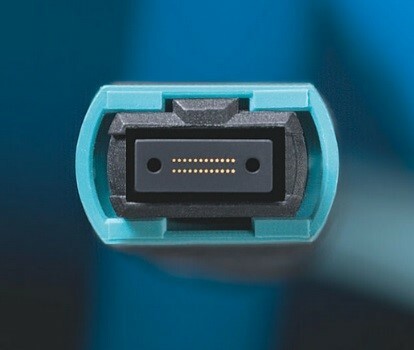 It had a slow start due to the initial high license fees from Lucent, but it is now considered the most popular connector type due to its 1.25mm ferrule size (half the size of SC, ST and FC connectors), low insertion loss performance and overall reliability. 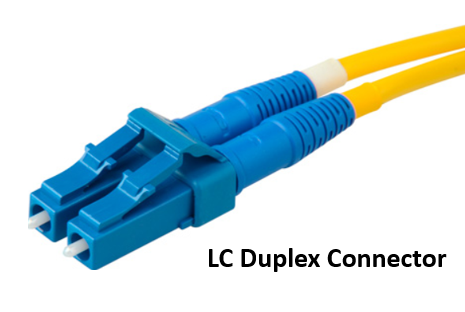 Similar to that of an RJ45 copper connector, the LC features a latch design that offer pull-proof stability. This design, combined with its smaller size, makes it ideal for high-density networks. It is also easy to terminate and comes in simplex and duplex designs, singlemode (APC or UPC) and multimode. The LC is covered by TIA-604-10 (FOCIS-10). While there are other 1.25mm connectors, such as the MU popular in Japan, the LC now dominates both singlemode and multimode deployments, which in part is due to its proliferation in active network equipment (Cisco SFP transceivers are all LC type). 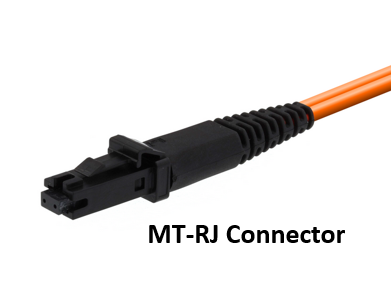 The only other SFF connector that at all gave the LC a run for its money in duplex multimode deployments is the MT-RJ. Covered by TIA-604-12 (FOCIS 12), the MT-RJ developed by AMP is an inexpensive duplex multimode connector that holds two fibers in a plastic ferrule and uses pins for alignment. This design does not offer the mating quality seen with ceramic ferrules, and therefore has higher insertion loss than the LC. The alignment pins of the MT-RJ also make them more difficult to clean, and compared to the LC, it received little support among active equipment manufacturers. The fiber connector you likely hear about the most these days is the MPO (multi-fiber push on) connector that supports higher-speed multi-fiber applications such as 8-fiber 40 and 100 Gig applications that transmit at 10 or 25 Gbps over 4 fibers and receive at 10 or 25 Gbps over 4 fibers. For space savings and manageability, the MPO is also often also used for backbone duplex fiber applications where the MPO is broken out to a duplex connector types such as LCs or SCs using cassettes or fan-out assemblies. The MPO, sometimes called by the brand name MTP, is covered by TIA-604-5 (FOCIS 5). It can contain anywhere from 8 to 72 fibers, with 8- or 12-fiber arrays being the most common for today’s multi-fiber applications. Each MPO connector is either male (with pins) or female (without pins) to ensure alignment of the fiber end faces during mating. Due to their multi-fiber pinned design, MPO connectors must also be positioned properly so that the transmit fibers match up to the appropriate receive fiber at the other end. 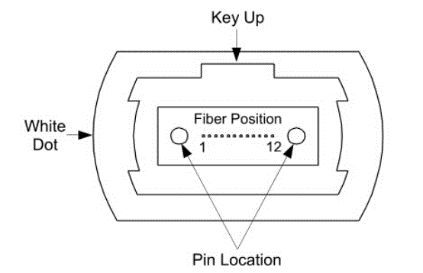 That’s why MPOs include a key on the top side of the connector and a white dot on the side to indicate the location of Fiber Position 1. You can learn more by visiting Fluke’s MPO Learn About. This article was originally published by Fluke Networks on their blog.